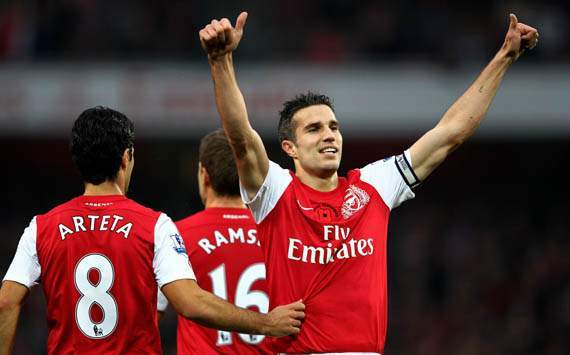 He scores when he wants he scores when he wants……as I am sure you all know my fellow Gooners Robin Van Persie has been named PFA player of the year, something for all us Arsenal lovers to smile about. He was my odds on favourite to win it (as I am sure is the case with many of you) 27 goals in the Premier League this season, he has in a lot of occasions been our saving grace. 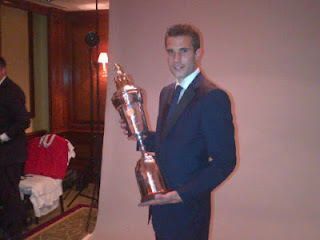 Van Persie beat off strong competition from Manchester City trio David Silva, Sergio Aguero and Joe Hart as well as Manchester United forward Wayne Rooney and S#%*s midfielder Scott Parker to take the award. The fact of the matter is Van Persie has been fantastic this season, if he did not get the award I would have eaten my shorts. This season we saw him become the 17th player to pass 100 goals for Arsenal during the course of the season and also beat Thierry Henry's Gunners record for most goals in a calendar year, but fell one short of Alan Shearer's Premier League record. If you follow the Twitter world you would have seen all the various players congratulating VP on his win. But what made me smile is that if you have been paying attention to Piers Morgan and Samir Nasri’s war of words, which resulted in a bet being made. Basically they have bet on who would win the next peace of silverware first, Arsenal or Man City. Great to see Piers winding up Samir that money hungry clown, but on that note I have decided I want United to win the League I don’t want Nasri to have the satisfaction of winning at City. Don’t know what your thoughts on this, but for the moment, let’s bask in the glow that is Robin Van Persie and smile to the knowledge that we have the best player in the Premier League.